2001 Eric Barnes received the Division on Dynamical Astronomy's Student Stipend Award. 2000 As a freshman at St. Joseph's Academy, Meagan Messina competed in the International Science Fair in Detroit, MI. Following her freshman year of high school in 1994, Holly attended our month-long, NSF-funded "Young Scholars" program here in the Department of Physics & Astronomy at LSU. She helped me develop a simple, but meaningful, mechanical model to illustrate how protostellar disks might fragment to form a binary star system. Holly currently is in her senior year at St. Joseph's Academy, Baton Rouge. In the summer of 1992, following her junior year of high school at Archbishop Blenk High School in Gretna, LA, Mandy attended our month-long, NSF-funded "Young Scholars in Astronomy and Space Sciences" program here at LSU. During that time, she constructed a simple, but meaningful computer model of warped galaxy disks, comparing the velocity maps of the modeled galaxies to published velocity maps of real galaxies. According to her resume, in May, 1997, Mandy graduated from Tulane University's School of Engineering with a B.S. in Biomedical Engineering. In the summer of 1993, James attended our month-long, NSF-funded "Young Scholars" program here at LSU. Working with me during that time, he located optical photographs of all the major spiral galaxies for which good HI (radio frequency) velocity maps exist and carefully measured quantitatively the structure (e.g., pitch-angle) of each optically visible spiral arm in each galaxy. This data has since been used to examine to what extent the twists in tilted-ring models of warped spiral galaxy disks match the optically visible spiral structure. In the fall of 1994, James enrolled in LSU's Honors College and immediately became involved in the research activities of the department's experimental gravity wave group. During his tenure at LSU he also worked with the low temperature, condensed matter group and participated in two NSF-sponsored summer research (REU) programs: one at Pennsylvania State University and another at UC, San Diego. In May, 1998, James expects to graduate with a 4.0 grade point average, having earned a dual degree: B.S. in Physics and a B.S. in Mathematics. Through the NSF's Division of Graduate Education, James has been awarded an NSF Graduate Research Fellowship in physics (out of 35 such awards nationwide; see the complete list of 1998 awards) and, in the fall, 1998, plans to join the experimental condensed matter physics Ph.D. program at Pennsylvania State University. "WEll Regional Science Fair was today, and you're probably wondering how I did. Well, I got first in my category and get to go to state. I won the navy most outstanding award and got a graphing calculator. I also won the army award and got a nifty booksack, and an invitation to the junior science symposium. To top it off, I won the whole fair. Yes that's right. I got best over all, so basically first for all projects int he high school division, and I get to go to international science fair where I'll be competing with 199 other countries from around the world." During his tenure as an undergraduate student at LSU (1985-89), Jeff Anderson worked with me for over three years, contributing quite significantly to my group's ongoing research activities. As an integral part of our efforts to analyze the results that came from large-scale numerical simulations of evolving astrophysical systems, Jeff took complete control of the computer programs that we had developed to construct and display three-dimensional images of protostellar gas clouds. (Our computer-imaging programs at the time executed on a VAX/750 and were derived from programs that had originally been developed under the direction of Gabor T. Herman in the Department of Radiology at the University of Pennsylvania Hospital to image medical CT-scan data.) Jeff constructed, catalogued, and stored on videotape literally thousands of images, producing some of our earliest animated sequences of time-evolving astrophysical models. During his first few years at LSU, Jeff pursued a double major in physics (astronomy option) and history. Ultimately, he decided to focus his efforts on history. He received his B.S. in History from LSU in 1989, and was accepted into the graduate History program at the University of Michigan. His graduate research has involved extended periods of study at the University of Oxford, England. While pursuing his B.S. degree in physics at LSU, Donovan worked with me and members of my research group for a couple of years. He helped me think through the design of a 3D volume rendering algorithm designed to execute on a massively parallel, distributed memory computer architecture and helped investigate possible connections between the twisted-disk structure of extended neutral hydrogen disks and optical spiral arms in spiral galaxies. Before leaving LSU, Donovan also generated some simple holographic images from purely numerical data to demonstrate how computer-generated holography might be useful in the analysis of time-evolving, complex 3D data sets. When he graduated from LSU, Donovan entered the Astronomy Ph.D. program within the Department of Physics & Astronomy at the University of Alabama. While there, he worked with Bill Keel and Gene Byrd, focusing on an infrared analysis of galaxies (see, for example, 2000, ApJ, 545, 171) and he attended the Les Houches 1998 Summer School on "Infrared Space Astronomy, Today and Tomorrow." While pursuing his B.S. degree in kinesiology at LSU, Pete worked with me extensively on the development of my online, graduate-level textbook entitled, "The Structure, Stability, and Dynamics of Self-Gravitating Systems." In particular, Pete helped me design the entire layout of the book, and he was reponsible for putting in, and keeping up-to-date, all the numerous hyperlinks within the book. Pete's work on this Hyper_Textbook has been formally acknowledged in the July/August issue of "Computers in Physics", where the book was featured in the "Internet Goldmine" section of the magazine. Pete completed his B.S. degree in December, 1999, and was admitted into medical school at the LSU Health Science Center in New Orleans, LA. Over the two-year period 1996-1998, Dave Sherfesee worked with me on a variety of technical programming tasks associated with my development of a graduate-level, on-line hypertext book entitled, "The Structure, Stability, and Dynamics of Self-Gravitating Systems." I am particularly grateful for the versatile, yet user-friendly interface that he developed between some of the book's hypertext pages and various Mathematica® tools. Check out, for example, his Mathematica Applications that permit the user to calculate the gradient, divergence, or Laplacian of virtually any analytically expressible functions in spherical coordinates. In December, 1997, Dave received his B.S. in Physics from LSU, having completed the degree in three and a half years with a 4.0 grade point average. Through the NSF's Division of Graduate Education, Dave has been awarded an NSF Graduate Research Fellowship in astronomy (out of 13 such awards nationwide; see the complete list of 1998 awards) and, in the fall, 1998, plans to join the astronomy Ph.D. program at UC, Berkeley. The summer between his freshman and sophomore years at Duke University, Jim attended an intensive 2-week, high-performance computing workshop at LSU that was organized by a handful of faculty associated with our Concurrent Computing Laboratory for Materials Simulation (CCLMS). In collaboration with another student (Gabe Rivera) attending the workshop, Jim designed from scratch an algorithm by which 3D data sets can be successfully imaged on a massively parallel, SIMD-architecture computer. Currently, Jim is pursuing his bachelor's degree in physics at Duke. Saied earned his Ph.D. in physics at LSU in 1998 under my direction, having successfully defended his Ph.D. dissertation entitled, "The Structure and Stability of Selected, 2-D Self-Gravitating Systems," Saied is presently employed as a computer systems manager in LSU's Department of Electrical and Computer Engineering. Under my direction, in the Spring of 2001, Eric successfully defended his Ph.D. dissertation entitled, "A Study of Stellar Orbits in a Rotating, Gaseous Bar," then moved to a postdoctoral position in the Department of Physics and Astronomy at Rutgers University. 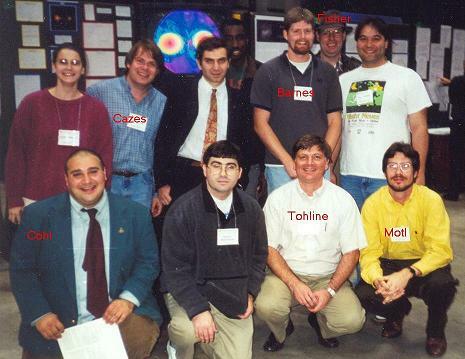 As a tribute to the high quality of Eric's dissertation research, Eric was awarded one of two Student Stipend awards to attend and present the results of his research at the April, 2001 meeting of the American Astronomical Society's Division on Dynamical Astronomy meeting. Under my direction, John successfully defended his Ph.D. dissertation entitled, "The Formation of Short Period Binary Star Systems from Stable, Self-Gravitating, Gaseous Systems," in 1999, then moved to a position with Raytheon in Washington, DC. As a tribute to John's accomplishments, and in recognition of the overall exceptional quality of his Ph.D. dissertation, John was awarded LSU's 1999 Distinguished Dissertation Award for the Science and Engineering Division. Under my direction, Howie successfully defended his Ph.D. dissertation entitled, "On the Numerical Solution of the Cylindrical Poisson Equation for Isolated Self-Gravitating Systems," in 1999, then moved to the position of Senior Principal Analyst & Training Systems Support Manager with the PET program at the Stennis Space Center in Stennis, MS. Under my direction, Paul successfully defended his Ph.D. dissertation entitled, "Nonaxisymmetric Equilibrium Models for Gaseous Galaxy Disks," in 1998, then moved to a tenure-track faculty position in the Physics Department at Northeast Louisiana University. In 2001, Patrick received his Ph.D. in Physics from LSU, having completed his dissertation entitled, "Numerical Simulations of Dynamical Mass Transfer in Binaries." This research work was conducted under the guidance of both Juhan Frank and me. In addition to the contribution to astrophysics that he has made through the completion of his dissertation research, Patrick has made two very significant contributions to our program here at LSU. First, he was extremely instrumental in helping us build and bring to full functionality the computer-controlled telescope that resides at Highland Road Park Observatory, which is jointly maintained and operated by LSU, the Park and Recreation Commission of East Baton Rouge Parish (BREC), and the Baton Rouge Astronomical Society (BRAS). Second, he completely rewrote my group's gravitational CFD code in a form that includes explicit calls to mpi and therefore permits it to be run efficiently on a variety of parallel computing platforms. This code has been or is being used now to study a variety of interesting astrophysical systems. Thanks, Patrick!! Upon completing his dissertation research, Patrick moved to the University of Missouri, accepting a postdoctoral position to work with Jack Burns on some cosmological problems. He has since moved -- following Burns -- to CASA in Boulder, CO.
Kim earned her Ph.D. in physics at LSU in 1996 under my direction, having successfully defended her dissertation entitled, "Instabilities in and Gravitational Radiation from Compact Stars and Compact Binary Systems. " She moved from LSU to a postdoctoral research position with Joan Centrella at Drexel University, then moved to Los Alamos, New Mexico where she held a postdoctoral research position in X-Division. Kim has since assumed a permanent position on the scientific staff of group X-2 at Los Alamos. Shangli earned his Ph.D. in physics at LSU in 2004 under my direction, having successfully defended his dissertation entitled, "Nonlinear Development of the Secular Bar-mode Instability in Rotating Neutron Stars." For six months, he took a postdoctoral position in LSU's interdisciplinary Center for Computation & Technology, then he returned to my group as a postdoctoral researcher to work on a variety of research problems of mutual interest. Horst completed his Ph.D. in physics at LSU in 1994 under the direction of Detlev Koester and Ganesh Chanmugam, then moved to Germany where he continued his research in a postdoctoral position (as a Wissenschaftlicher Assistent) at the Institute for Astronomy and Astrophysics, University of Kiel, Germany. Currently, Horst is employed at SAP, a large international software company that is based in Germany. Harold completed his Ph.D. in physics at LSU in 1988 under my direction, successfully defending his dissertation entitled, "Star Formation, Using 3-D Explicit Eulerian Hydrodynamics." He then accepted a postdoctoral research position at the Carnegie Institution of Washington (DTM). He is presently director of the Montgomery College Planetarium in Takoma Park, Maryland and is a very active member in the Washington, DC area of the National Capital Astronomers. John completed his Ph.D. in physics at LSU in 1992 under my direction, successfully defending his dissertation entitled, "The Stability of Thick, Self-Gravitating Disks in Protostellar Systems. " He then moved to an instructorship position in the physics department at the University of Texas, El Paso. From his base in El Paso, John also built a reputation as an excellent computing consultant to NeXT Corporation. John is currently employed as a consultant for Valtech, Inc. (previously Expede) in Dallas, TX, after a 3-year stint with Raytheon E-Systems. Erik completed his Ph.D. in physics at LSU in 1998, having submitted to the LSU Graduate Faculty a dissertation entitled, "Magnetic Field Evolution in Neutron Stars." During his last two years of graduate work, Erik worked jointly under my and Juhan Frank's supervision. However, the bulk of Erik's dissertation research was conducted under the guidance and direction of our beloved colleague, Ganesh Chanmugam. Juhan and I "adopted" Erik when Ganesh passed away in March of 1996. In August, 1998, Erik took his technical physics training to the University of Arkansas Medical School where he is now enrolled as a medical student. As a tribute to Erik's accomplishments under Ganesh Chanmugam's direction, and in recognition of the overall exceptional quality of his Ph.D. dissertation, Erik was awarded LSU's 1998 Distinguished Dissertation Award for the Science and Engineering Division. Year of Ph.D. Student Name ETD Jointly Advised?